AKA stands for "Authentication and key agreement". This scheme comes from the legacy 3gpp networks and has been widely used in LTE, 3G, CDMA and WiMAX technologies. 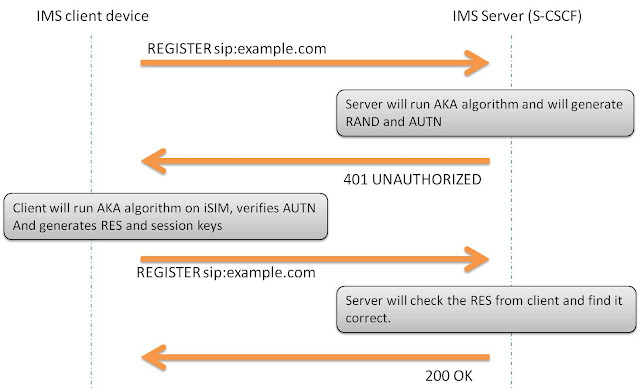 In this mechanism, a secret key is already known to both user device (USIM, iSIM) and authentication servers (HSS, HLR). The server will challenge the end user using AKA algorithms and shared key and sends RAND, AUTN values towards UE. UE will authenticate network and prepares result (RES for network to authenticate UE) with the help of shared key in UICC and parameters sent by Server. Http Digest is the popular authentication scheme used for authenticating users to access web servers and other applications which requires security and data integrity. This scheme is much secure than the basic authentication as it applies hash function to the password before sending it [RFC2617]. With 3GPP AKA digest, the "nonce" now contains RAND, AUTN. The password now contains the one time RESPONSE generated by client with help of UICC (USIM, ISIM). Thus the method is even more secure. If i may want to summarize the content of this weblog i might factor out to the vital one - create your personal content material. visit here copying is terrible to your internet site. As the world is coming out of the wire and becoming a wireless technology, this post is actually a real help for those who want to discover about it. That's really a detailed overview of AKA Digest authentication scheme for VoLTE (IMS).This topic is new for me so I took time to understand it properly.